Stock Photography Adobe Stock Used with permission Copyright ÂŠ 2018 by KROSTCPAs.com All rights reserved. No part of this publication may be reproduced, distributed, or transmitted in any form or by any means, including photocopying, recording, or other electronic or mechanical methods, without the prior written permission of the publisher, except in the case of brief quotations embodied in critical reviews and certain other noncommercial uses permitted by copyright law. 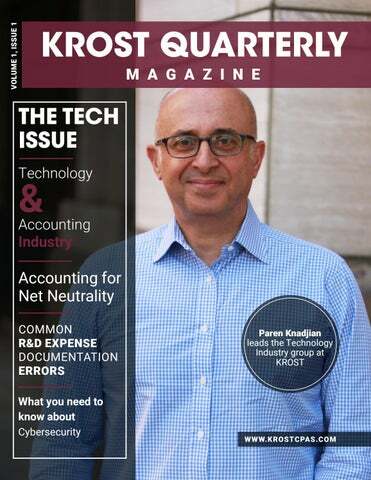 THE TECH ISSUE KROST Quarterly is a digital publication released by KROST CPAs & Consultants headquartered in Pasadena, California. Established in 1939, this full-service Certified Public Accounting and Consulting firm serves clients across a variety of industries. With a focus on recognizing opportunities and creating value, KROST equips clients with tools to make better business and financial decisions for the future. 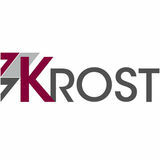 Our team produces regular “think pieces” posted to KROST’s website monthly. This issue of KROST Quarterly will highlight some of the most thought-provoking pieces of late. Topics include cryptocurrency, net neutrality, R&D expense reporting, and many more. Receive KROST news right to your inbox! To subscribe, click here. efore diving into global investment trends in Artificial Intelligence (“AI”) and Machine Learning (“ML”), it may be worth quickly defining them. To quote John McCarthy, widely recognized as one of the preimminent leaders in this space, AI is defined as “The science and engineering of making intelligent machines.” AI systems can perform tasks that normally require human intelligence, such as visual perception, speech recognition, decision-making, and language translation. Machine Learning is a subset of AI. The main characteristic that separates Machine Learning from most AI is its ability to modify itself when exposed to more data; i.e. Machine Learning is dynamic and does not require human intervention to make certain changes. According to Arthur Samuel, another pioneer in this space, machine learning is “A field of study that gives computers the ability to learn without being explicitly programmed.” AI has deeply penetrated virtually every industry from agriculture to adtech, from cybersecurity to manufacturing, from fintech to healthcare. We’re also interacting with AI in our everyday lives from giving voice commands to mobile phones to playing gesture-controlled video games. If the hype around ML is beginning to fade (perhaps overtaken by the hype on cryptocurrencies and blockchain) it may be because it has already become part of virtually every major piece of software, from calendar apps to search engines to sales management software. So, which countries are leading investments in AI and ML and which countries are homes to these investments? Two countries dominate the United States and China. any taxpayers realized significant gains from the disposition of cryptocurrencies in 2017, and as tax season approached, these taxpayers had to compile accounting reports, review the latest tax guidance, and determine how to correctly report their transactions to the IRS. In the summer of 2017, the IRS narrowed its summons against Coinbase, the largest U.S.based coin exchange, to retrieve information on large trades and other transactions to find unreported income. At the very end of 2017, Coinbase added tax reporting of capital gains and losses using first in, first out (FIFO), which pleases the IRS and helps taxpayers report their transactions since coin trades are currently not reported on Form 1099-B. The IRS classifies cryptocurrencies as “intangible property” (a capital asset) because they are not sovereign government-issued money. If you sold, exchanged, or spent a cryptocurrency in 2017, you need to calculate a capital gain or loss on each transaction, including cointo-currency trades, coin-to-coin trades, and purchases of goods or services using a coin. Coin-to-currency trades (e.g., the sale of a coin for U.S. dollars) should be reported as a capital gain or loss on Form 8949 just like any stock trade. For example, if you purchased one Bitcoin for $500 in 2016, held it for over a year, and sold it for $10,500 in 2017, then you need to report a long-term capital gain of $10,000, which would be taxed at capital gains tax rates (up to 23.8% in 2017 and 2018). If you held the coin for one year or less before selling it for a gain, you would need to report a short-term capital gain, which would be taxed at ordinary income tax rates (up to 39.6% in 2017 or 37% in 2018). Although capital losses offset capital gains, net capital losses are capped at $3,000 per year, so net capital losses in excess of $3,000 are carried forward to the subsequent tax year and cannot be carried back to a prior tax year. Certain coins can be obtained by “mining,” which requires significant computing power. When a coin miner receives a coin for his or her mining services, he or she should report business income based on the value of the coin he or she received. Many coin traders actively trade one type of coin for another type of coin, and some of these coin traders take the ill-conceived position that they can defer capital gains on cointo-coin trades by inappropriately classifying them as Section 1031 “like-kind” exchanges. A like-kind exchange is a transaction or series of transactions that allows for the disposal of an asset and the acquisition of another replacement asset without generating a current tax liability from the sale of the first asset. As of January 2018, the IRS has not yet provided guidance on this matter, but many experienced tax practitioners believe coin-to-coin trades made on coin exchanges do not qualify as like-kind exchanges because they fail one or both of the primary requirements for a like-kind exchange (and both are required). First, one type of coin is not like-kind property with another type of coin. Second, coin-to-coin trades executed on coin exchanges do not constitute a direct two-party exchange, and coin exchanges are not qualified intermediaries in a multi-party exchange. Atomic swaps or atomic cross-chain trading started in August 2017. The new technology allows a direct two-party exchange, bypassing coin exchanges. That may meet one requirement for a like-kind exchange, but the coins must also be a like-kind property for the gain deferral, which is a position that will likely be scrutinized by the IRS. Beginning in 2018, the new tax law limits like-kind exchanges to real property. This means taxpayers may no longer utilize like-kind exchanges for artwork, collectibles, and other tangible and intangible property, including cryptocurrencies. The new tax law created Section 199A, which provides a 20% deduction of qualified business income (QBI) for passthrough entities (S corporations, partnerships, LLCs, and sole proprietorships). The 20% deduction of QBI is subject to numerous thresholds and limitations. Unfortunately, a coin trader likely does not qualify for the deduction because he or she has capital gains income, which is excluded from QBI. On the other hand, a securities trader with trader tax status can elect Section 475 mark-to-market ordinary income, which is included in QBI. Taxpayers can deduct coin fees and other expenses that they incurred in 2017, but most will not be able to deduct such fees and expenses beginning in 2018 because the new tax law suspends the deduction for investment expenses. ll too often we read headlines about major companies that have some sort of breach, Equifax, Target, Sony, Home Depot, just to mention a few. Most people think, “Wow, how could they be that careless and then go about their day?” Recently, the Equifax hack hit home for most Americans because it virtually affected everyone. Most people should be wondering if it can happen to them, it can happen to me and my company. One of the easiest ways for a hacker to disrupt a business today is with ransomware. hen it comes to technology nothing has taken the business world by storm like cryptocurrency. However, something that slid under the radar and continues to slide under the radar with an everlasting impact are the changes to the Net Neutrality Rules. Net Neutrality is dead, but what does this even mean? Net Neutrality is the concept that all internet is created equal. The idea of Net Neutrality forbids selective “throttling” or slowing down the internet for certain content providers (i.e. websites). In December 2017, the Federal Communications Commission voted to repeal Net Neutrality Rules. The overwhelming fear is that consumers will have content either blocked or throttled while trying to access websites or delivery of content. Throttling or blocking content will push businesses to pay internet providers additional fees to maintain consumers’ current internet experience. The change is expected to be a slow rollout and companies will have an opportunity to pay internet providers additional fees to allow their customers to stay in the “fast lanes.” The struggle will be real for smaller businesses that need reliable internet services because fees for paid prioritization are expected to be high. n March 25, 2014, the IRS released Notice 24-21 detailing how existing general tax principles should apply to transactions involving virtual currency. The IRS defines virtual currency as a “digital representation of value that functions as a medium of exchange, a unit of account, and/or a store of value.” Examples of virtual currency include, but are not limited to, Bitcoin, Ethereum, Litecoin, Zcash, and Monero. Virtual currency that has an equivalent value in real currency, or that can be used as a substitute for real currency, is referred to as “convertible” virtual currency. Bitcoin is a prime example of convertible virtual currency. In general, the sale or exchange of convertible virtual currency, or the use of convertible virtual currency to pay for goods or services in a real-world economy transaction, has tax implications. The tax liability is determined on how virtual currency is held and used. Virtual Currency Held as Assets For federal tax purposes, virtual currency is treated as property, and therefore, general tax principles applicable to property apply to transactions using virtual currency. This requires for gains and losses upon an exchange of virtual currency to be calculated. To stay in compliance with IRS regulations, virtual currency users should track the gains or losses of each of their virtual currency transactions. Additionally, virtual currency is not treated as foreign currency. Therefore, it does not need to be reported on an FBAR, nor can it generate foreign currency exchange gains or losses. If the virtual currency is held as a capital asset, such as a stock or a bond, then any gain or loss on the sale or exchange of the virtual currency is taxed as a capital gain or loss. Otherwise, the taxpayer realizes ordinary gain or loss on an exchange if the virtual currency is not held as a capital asset. Virtual Currency Used to Pay for Goods and Services A taxpayer who receives virtual currency as payment for goods or services must include the fair market value of the currency received in gross income. For U.S. tax purposes, transactions using virtual currency must be reported in U.S. dollars. Therefore, taxpayers will be required to determine the fair market value of virtual currency in U.S. dollars as of the date of payment or receipt. A payment made using virtual currency is subject to information reporting to the same extent as another payment made in property. Employers must report, on a W-2, the amount of wages paid to employees using virtual currency. Also, an independent contractor receiving payments of virtual currency is subject to self-employment taxes. Businesses should report payments to independent contractors in amounts over $600 on Form 1099-MISC. These payments are subject to the same rules as they normally would for 1099 filing requirements. usiness owners are often surprised to learn they may be able to claim the Research & Development (R&D) tax credit. The credit was originally created as a way to encourage American companies to conduct R&D activities domestically. While initially thought to apply to large companies with formal R&D departments, “smaller businesses” in a wide range of industries, such as manufacturing, engineering, software development, architecture, pharmaceutical, aerospace and defense, metal foundries, chemical companies and others, have discovered they can also claim the benefit. However, it’s important to be aware of best practices when claiming the credit, especially in areas where issues commonly arise, such as a lack of supporting documentation. Mistakes in documenting qualified research can result in missed opportunities and create problems should the company be selected for an IRS audit. To help clients, prospects and others avoid common documentation mistakes, KBKG has provided a summary of common errors and best practices below. left as a task to complete at year-end. When this happens, a single person is often assigned the task of pouring over hundreds of documents to find proof of qualifying expenses. The result is that expenses are often missed, and the potential credit value is diminished. To overcome this, a best practice would be to implement a process that collects relevant information on an ongoing basis, while the R&D activities are occurring. The more thorough the process, the greater the likelihood that qualifying expenses will be captured and used appropriately when claiming the credit. • Lack of Clarity – A common issue in the documentation process is that it’s unclear how the various expenses, personnel or other items relate to the R&D project. Remember that an IRS agent will not be familiar with your business, product or research process. Because they will be the primary judge of whether an expense qualifies toward the R&D credit, its essential to ensure the relationship between the expense and qualifying activity is clear. Avoid incomplete or inadequate descriptions, general statements that sound canned and documentation that is not clearly related to the project. The more you rely on an IRS auditor to figure out how your documentation supports expenses, the greater the risk exposure. With over 75 years of experience, KROST has assisted businesses and individuals reach their financial goals through their in-depth knowledge of tax, accounting, assurance and advisory, M&A, and consulting services. KROST also provides specialty tax services such as Cost Segregation studies, R&D tax credits, Green Building Tax Incentives, Repair vs. Capitalization, Fixed Asset, IC-DISC, and more.